The heart-lung machine is medical equipment that provides cardiopulmonary bypass, or mechanical circulatory support of the heart and lungs. The machine may consist of venous and arterial cannula (tubes), polyvinyl chloride (PVC) or silicone tubing, reservoir (to hold blood), bubbler or membrane oxygenator, cardiotomy (filtered reservoir), heat exchanger(s), arterial line filter, pump(s), flow meter, inline blood gas and electrolyte analyzer, and pressure-monitoring devices. Treatment provides removal of carbon dioxide from the blood, oxygen delivery to the blood, blood flow to the body, and/or temperature maintenance. Pediatric and adult patients both benefit from this technology. 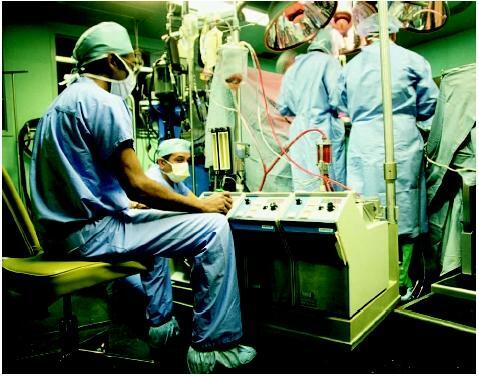 In the operating room , the heart-lung machine is used primarily to provide blood flow and respiration for the patient while the heart is stopped. Surgeons are able to perform coronary artery bypass grafting (CABG), open-heart surgery for valve repair or repair of cardiac anomalies, and aortic aneurysm repairs, along with treatment of other cardiac-related diseases. The heart-lung machine provides the benefit of a motionless heart in an almost bloodless surgical field. Cardioplegia solution is delivered to the heart, resulting in cardiac arrest (heart stoppage). The heart-lung machine is invaluable during this time since the patient is unable to maintain blood flow to the lungs or the body. Photograph by Albert Paglialunga. Phototake NYC. Reproduced by permission. and maintain blood flow and respiration. The diseased heart or lung(s) is replaced by this technology, providing time for the organ(s) to heal. The heart-lung machine can be used with venoarterial extracorporeal membrane oxygenation (ECMO), which is used primarily in the treatment of lung disease. Cardiopulmonary support is useful during percutaneous transluminal coronary angioplasty (PTCA) and stent procedures performed with cardiac catheterization. Both treatments can be instituted in the critical care unit when severe heart or lung disease is no longer treatable by less-invasive conventional treatments such as pharmaceuticals, intra-aortic balloon pump (IABP), and mechanical ventilation with a respirator. Use of this treatment in the emergency room is not limited to patients suffering heart or lung failure. In severe cases of hypothermia, a patient's body temperature can be corrected by extracorporeal circulation with the heart-lung machine. Blood is warmed as it passes over the heat exchanger. The warmed blood returns to the body, gradually increasing the patient's body temperature to normal. Tertiary care facilities are able to support the staffing required to operate and maintain this technology. Level I trauma centers have access to this specialized treatment and equipment. Being that this technology serves both adult and pediatric patients, specialized children's hospitals may provide treatment with the heart-lung machine for venoarterial ECMO. The pump oxygenator had its first success on May 6, 1953. Continued research and design have allowed the heart-lung machine to become a standard of care in the treatment of heart and lung disease, while supporting other non-conventional treatments. Foreign surfaces of the heart-lung machine activate blood coagulation, proteins, and platelets, which lead to clot formation. In the heart-lung machine, clot formation would block the flow of blood. As venous and arterial cannulas are inserted, medications are administered to provide anticoagulation of the blood which prevents clot formation and allows blood flow through the heart-lung machine. Large vessels (veins and arteries) are required for cannulation, to insert the tubes (cannulas) that will carry the blood away from the patient to the heart-lung machine and to return the blood from the heart-lung machine to the patient. Cannulation sites for venous access can include the inferior and superior vena cava, the right atrium (the upper chamber of the heart), the femoral vein (in the groin), or internal jugular vein. Oxygen-rich blood will be returned to the aorta, femoral artery, or carotid artery (in the neck). By removing oxygen-poor blood from the right side of the heart and returning oxygen-rich blood to the left side, heart-lung bypass is achieved. The standard heart-lung machine typically includes up to five pump assemblies. A centrifugal or roller head pump can be used in the arterial position for extracorporeal circulation of the blood. The four remaining pumps are roller pump in design to provide fluid, gas, and liquid for delivery or removal to the heart chambers and surgical field. Left ventricular blood return is accomplished by roller pump, drawing blood away from the heart. Surgical suction created by the roller pump removes accumulated fluid from the general surgical field. The cardioplegia delivery pump is used to deliver a high potassium solution to the coronary vessels. The potassium arrests the heart so that the surgical field is motionless during surgical procedures. An additional pump is available for emergency backup of the arterial pump in case of mechanical failure. A pump is required to produce blood flow. Currently, roller and centrifugal pump designs are the standard of care. Both modern designs can provide pulsatile (pulsed, as from a heartbeat) or non-pulsatile blood flow to the systemic circulation. The roller assembly rotates and engages the tubing, PVC or silicone, which is then compressed against the pump's housing, propelling blood ahead of the roller head. Rotational frequency and inner diameter of the tubing determine blood flow. Because of its occlusive nature, the pump can be used to remove blood from the surgical field by creating negative pressure on the inflow side of the pump head. The centrifugal pump also has a negative inlet pressure. As a safety feature, this pump disengages when air bubbles are introduced. The centrifugal force draws blood into the center of the device. Blood is propelled and released to the outflow tract tangential to the pump housing. Rotational speed determines the amount of blood flow, which is measured by a flowmeter placed adjacent to the pump housing. If rotational frequency is too low, blood may flow in the wrong direction since the system is non-occlusive in nature. Magnetic coupling links the centrifugal pump to the control unit. A reservoir collects blood drained from the venous circulation. Tubing connects the venous cannulae to the reservoir. Reservoir designs include open or closed systems. The open system displays graduated demarcations corresponding to blood volume in the container. The design is open to atmosphere, allowing blood to interface with atmospheric gasses. The pliable bag of the closed system eliminates the air-blood interface, while still being exposed to atmospheric pressure. Volume is measured by weight or by change in radius of the container. The closed reservoir collapses when emptied, as an additional safety feature. Bubble oxygenators use the reservoir for ventilation. When the reservoir is examined from the exterior, the blood is already oxygen rich and appears bright red. As blood enters the reservoir, gaseous emboli are mixed directly with the blood. Oxygen and carbon dioxide are exchanged across the boundary layer of the blood and gas bubbles. The blood will then pass through a filter that is coated with an antifoam solution, which helps to remove fine bubbles. As blood pools in the reservoir, it has already exchanged carbon dioxide and oxygen. From here, tubing carries the blood to the rest of the heart-lung machine. In opposition to this technique is the membrane oxygenator. Tubing carries the oxygen-poor blood from the reservoir through the pump to the membrane oxygenator. Oxygen and carbon dioxide cross a membrane that separates the blood from the ventilation gasses. As blood leaves the oxygenator, it is oxygen rich and bright red in color. When blood is ready to be returned from the heart-lung machine to the patient, the arterial line filter will be encountered. This device is used to filter small air bubbles that may have entered, or been generated by, the heart-lung machine. Following this, filter tubing completes the blood path as it returns the blood to the arterial cannula to enter the body. Fluid being returned from the left ventricle and surgical suction require filtration before the blood is reintroduced to the heart-lung machine. Blood enters a filtered reservoir, called a cardiotomy, which is connected with tubing to the venous reservoir. Other fluids such as blood products and medications are also added into the cardiotomy for filtration of particulate. Heat exchangers allow body and organ temperatures to be adjusted. The simplest heat exchange design is a bucket of water. As the blood passes through the tubing placed in the bath, the blood temperature will change. A more sophisticated system separates the blood and water interface with a metallic barrier. As the water temperature is changed, so is the blood temperature, which enters the body or organ circulation, which changes the tissue temperature. Once the tissue temperature reaches the desired level, the water temperature is maintained. Being able to cool the blood helps to preserve the organ and body by metabolizing fewer energy stores. Because respiration is being controlled, and a machine is meeting metabolic demand, it is necessary to monitor the patient's blood chemical makeup. Chemical sensors placed in the blood path are able to detect the amount of oxygen bound to hemoglobin. Other, more elaborate sensors can constantly trend the blood pH, partial pressure of oxygen and carbon dioxide, and electrolytes. This constant trending can quickly analyze the metabolic demands of the body. Sensors that communicate system pressures are also a necessity. These transducers are placed in areas where pressure is high, after the pump. Readings outside of normal ranges often alert the operator to obstructions in the blood-flow path. The alert of high pressure must be corrected quickly as the heart-lung machine equipment may disengage under the stress of abnormally elevated pressures. Low-pressure readings can be just as serious, alerting the user to faulty connections or equipment. Constant monitoring and proper alarms help to protect the integrity of the system. Constant scanning of all components and monitoring devices is required. Normal values can quickly change due to device failure or sudden mechanical constrictions. The diagnosis of a problem and quick troubleshooting techniques will prevent additional complications. Continuous scanning of all patient monitors is necessary for proper treatment and troubleshooting. Documentation of patient status is obtained every 15–30 minutes. This information allows the physician and nursing staff to follow trends that will help better manage the patient once treatment is discontinued. At the termination of device support, the perfusionist or ECMO specialist must communicate clearly to the physician all changes in support status. This allows the entire team to assess changes in patient parameters that are consistent with the patient becoming less dependent on the device, while the patient's heart and lungs meet the metabolic demands of the body. It is the responsibility of the perfusionist or ECMO specialist to be at the device controls at all times. Gravelee, Glenn P., Richard F. Davis, Mark Kurusz, and Joe R. Utley. Cardiopulmonary Bypass: Principles and Practice, 2nd edition. Philadelphia: Lippincott Williams & Wilkins, 2000. American Society of Extra-corporeal Technology. 503 Carlisle Dr., Suite 125, Herndon, VA 20170. (703) 435-8556. http://www.amsect.org . Commission on Accreditation of Allied Health Education Programs. 1740 Gilpin Street, Denver, CO 80218. (303) 320-7701. http://www.caahep.org . Extracorporeal Life Support Organization (ELSO). 1327 Jones Drive, Suite 101, Ann Arbor, MI 48105. (734) 998-6600. http://www.elso.med.umich.edu/ . Joint Commission on Accreditation of Health Organizations. One Renaissance Boulevard, Oakbrook Terrace, IL 60181. (630) 792-5000. http://www.jcaho.org/ . THIS IS VERY USEFUL INFORMATION, BUT HOW HAS IT CHANGED OVER TIME THOUGH? I will have a Cox III maze, on 12-31-2009. I was told that I will nneed to be put on a Heart Lung machine. What is the current update information for this? My little grandson was born sep 28 2009. he was flown to childrens hospital in okc where he was placed on ecmo. He was flown there with plumanary hypertion. He was full term. The next day of being there they wanted to place him on ecmo. While palcing him ecmo the arerary in the neck was torn, they said because of the artery being bent or curve in the artery.They new he had ph how come they did not do a sonagram before the procedure to rule out the arteries being messed up. From there they went straight to the heart with the canulas leaving his heart open for two weeks. Then on top of that the hoses blew off the machine spraying blood all over the room and the baby. We have has a atorney look at this. we presented them the case in november 20009 right after the funeral was over. They held the paper work on this case until Septimber 1, 2010 and then let the family know that we had no case. Now the dead line up up and noe other attorney will look at the case. I know you all have knowing to to do with what im saying you all just deal with ecmo information. But I had to get this off of my chest. And that hospital needs to see that there equipment is more up to date and working and the needed slupplies are there for the patient when need. they should of never of done hunters canulation until they had the correct size and checked his veins before they started. Plus Kept there ecmo equipment up to date. THe lawyers say theres no case and everything went like if was suppost to. But my gut tells me different. From reading this article they could of went in to his grown and left his heart alone. I had a Triplt-By Pass in Nov 2008.I was temporarily delusional,The part that hurts the most is that I lost some of my vision No one even mentioned durtng recovery To be truthfull I would have refused to have the operation if I knew I would lose some of my vision. My sister Marge had a valuv replacement, and a quadruple bypass surgery she was on the lung heart machine for 7 hr. Afterwards her kidneys and liver had some problems, then they had to do emergency surgery because the Dr. Said he thought her intestin my have died. As it turned out they had to remove her colon, gallbladder, and most of her lower intestin she died within a week of her original surgery. We were never informed of how high the risk was. We were told she would be home 5 days after her surgery and she would be recovered in time to attend her first grandsons wedding on Nov. 7 2015. She died Oct. 2 2015. I truly feel if she had known the risk involved she would have wanted to wait till after the wedding. She was buried in the dress she bought for the wedding. Doctors should give more information about the risks involved. I may be faced with bypass surgery and valve repair/replacement surgery. If so, can these procedures be done ate the same time? Is there a downside to being on a heart/lung device longer. What are the pros and cons here? I look forward to and thank you in advance for your response and advice. I had a valve replacement 3 years ago, I was 47, my physical recovery took about 4-6 months, however as you pointed out the other side affects were subtle but brutal. I had cognitive issues that I feel I am just not recovering from. My memory was shot, my ability to learn and focus were impaired greatly and my mental agility(quick thinking) was all but gone. I also had ocular incidents where I would get vertigo and my eyes felt like they would cross, initially these episodes would last up to 10 minutes and would happen 3-4 times per week, almost 4 years later and I am feeling much better have most of my symptoms have disappeared. When I told my cardio he said it sounded like "Pump head" and based on my research i felt the same, but there are alot of articles indicating that there are no associations between bypass and cognitive impairments, I disagree. It will take awhile but your hubbie will most likely recover after time. I am working as a perfusionist in sri lanka.I was involved 3000 open heart surgery last 8 years. This information very important to us,we need latest information regarding perfusion and more graphical representation. I'm 62, have sever COPD and In 2010 I had open heart surgery to replace my aortic heart valve with a bovine cow valve. Unknown to me before surgery the DR told my wife because of his sever COPD they may not be able to take me off the lung machine, That turned out not to be the case and they were able to remove the tube. Currently I'm going threw heart test to determine how much the new valve is leaking, six months ago it was leaking 50 %. When discussing with the cardiologist he stated that I probably am not eligible to have 0pen heart surgery again because the second time I would even be at a higher risk for coming off the lung machine because the surgery would take longer and as a result longer on the machine therefore less likely to come off lung machine. If I was able to have the surgery again and could not come off the lung machine then what would be my life options as a result of being on the lung machine, in other words, now what?